I recently had the opportunity to speak to a group of students and faculty at Boston University’s Kilichand Honors Program. I have done so many radio programs where the host asks me what is wrong with today’s young people that I wasn’t expecting much. 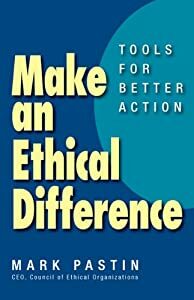 My plan was to cover the main points in Make an Ethical Difference in simplified form. I got a big surprise. The students got very involved in the topic and, to my delight, they showed a level of ethical thinking that is not supposed to exist anymore. They were truly exceptional. The faculty at Kilichand were another pleasant surprise as many were dedicated to integrating ethics in the design of the overall curriculum. I know that this was not a representative sample, but it was a sample and the students and faculty were real! So while we are wringing our hands about today’s kids, please remember that there are some good ones – and some good adults too.